The insolvency outlook for 2015 has weakened. Total insolvencies are forecast to fall only 7% compared to the previously forecast 10%. 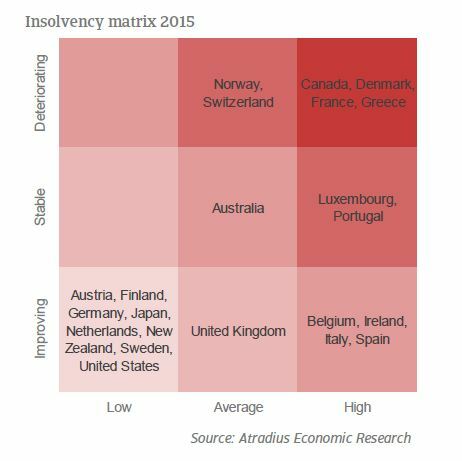 This is due to poorer insolvency developments than originally expected in a large number of countries. Despite the modest improvement, insolvency levels in the eurozone are still 75% higher in 2015 than in 2007, and will remain 67% higher in 2016. Insolvency conditions are improving in the eurozone, on the back of higher economic growth and better credit conditions. 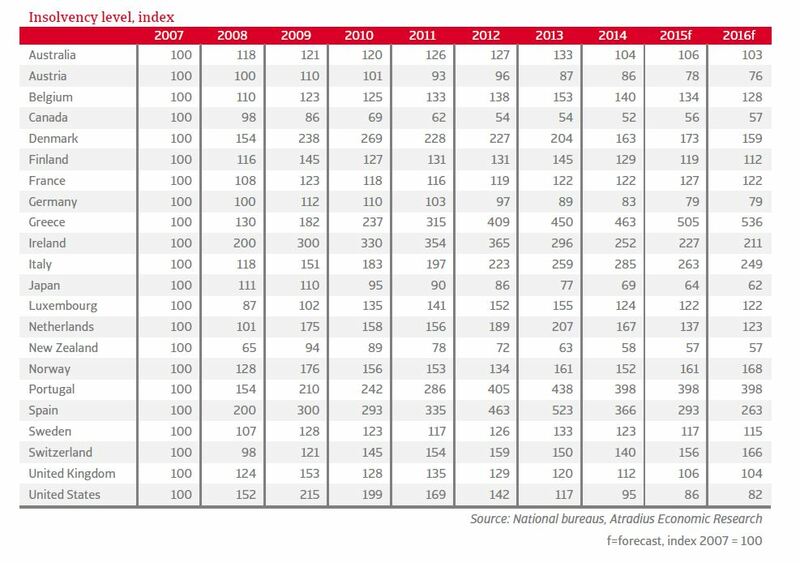 The insolvency outlook for 2015 is not as optimistic as it was in the May 2015 Economic Outlook the positive development in many markets has been revised downward, indicating that the business environment is still difficult. For instance, the previous quarter’s forecast for Belgium was -11% in 2015, but as a result of declining consumer confidence and consumption, a more modest - 4% change in insolvencies is forecast. 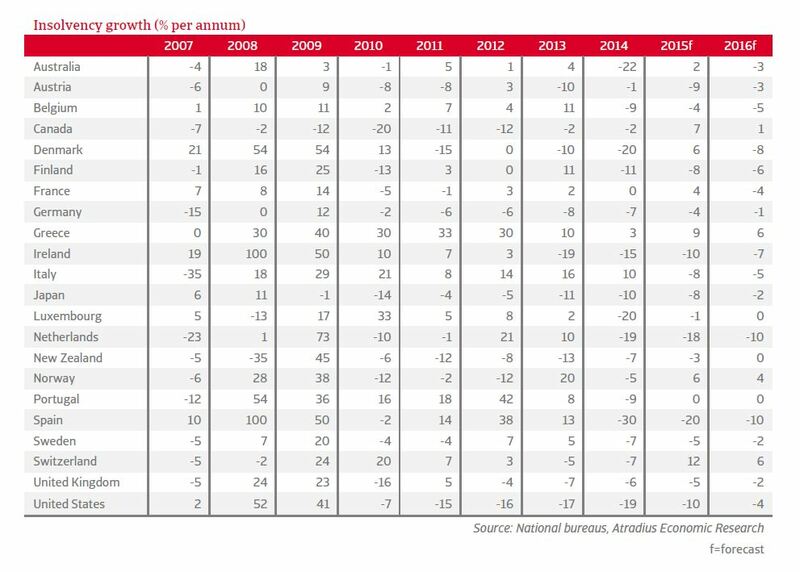 In the previous quarter, it appeared that strengthening economic recoveries would finally start making it easier for French and Greek businesses to operate – French insolvencies were forecast to fall 2% and for the first time since 2007, Greek insolvencies were expected to remain unchanged. 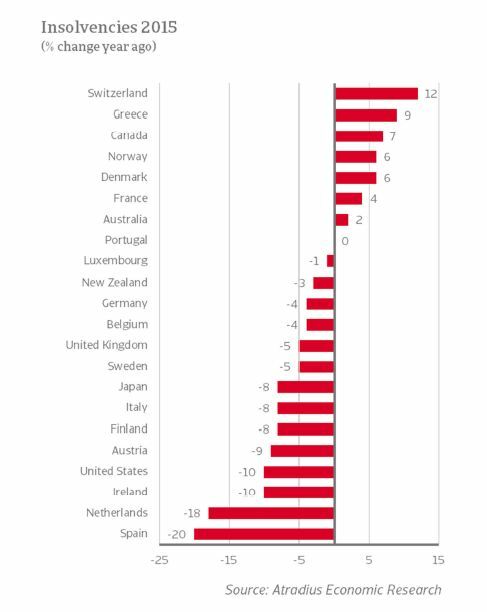 Less positive forecasts can also be seen outside the eurozone, most notably in Switzerland and Australia. Swiss businesses have been hit by a surge in the Swiss franc, stemming from the removal of the currency’s cap against the euro, which has made the country’s exports more expensive. Business failures are expected to rise 12%, 12 percentage points higher than second quarter estimates. Australia, whose economy is largely intertwined with that of Asia and also dependent on commodity exports, is now forecast to see insolvencies rise by 2%, compared to a previous forecast of a 9% decrease. Low commodity prices are the driver of rising business failures in Canada and Norway this year and next. Canada, the fourth-largest oil exporter in the world, has entered a recession in the first half of 2015, particularly suffering from a drop in investment in the energy sector. Norway, whose economy is suffering because of its many companies in the oil and gas sector, is cutting back investment plans and putting existing developments on hold. 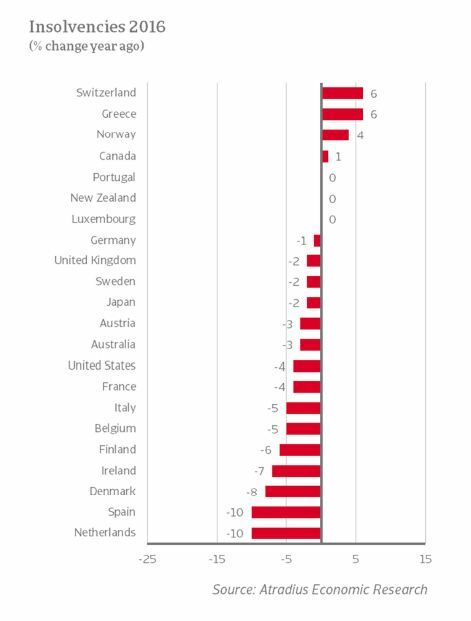 The business environments in both countries may see gradual improvement on the back of rising oil prices in 2016, but are expected to still worsen slightly in 2015: -1% in Canada and -4% in Norway. In 2015 production is expected to increase at around 2%, the same level as in 2014.